Rig-a-Jig-Jig was started in 1999 by Des Miller to collect and document information about the traditional musical history of Norfolk. Des and Chris collect peoples' memories of local music making in the form of taped interviews which are transcribed, photographs, recordings and film, and currently have a large and growing archive. 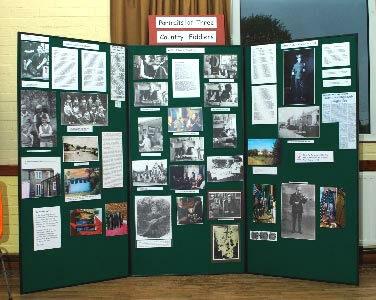 At Rig-a-Jig-Jig events, sometimes working in conjunction with a village or district, we present this archive material to the public, particularly in the form of displays of photographs. These events also feature live music: tunes, songs and step dancing from the band and various friends. Come from Norfolk? Want to help us? Did you play the ‘old music’, sing - or dance? Or do you remember someone who did - or who still does? If so, we’d like to hear from you. Your memories, photographs and home recordings are important ways for us to find out about the people who played and enjoyed the music. If you would allow us to make copies of your mementos, they could become part of our display and archive. You'll find our contact details on the Contact page of this site.